My grandfather has Alzheimer’s and I read in a science article that a sound or light “played” at 40 Hz interacts with the waves in your brain to break apart the plaque build-up and reduce memory loss. My thought was that if I were able to change the frequency of the light sockets (a screw in an attachment that I would build, but I can figure the structure of it up, just not the electrical side of it) then there would constantly be an atmosphere of a pulsing 40 Hz, via the lights. Any help as far as the initial wiring of this device would be amazing. If I can get a start I can probably finish it. Thanks! Elijah Rhodes is a new contributor to this site. Take care in asking for clarification, commenting, and answering. Check out our Code of Conduct. Pulse the lights (I'm presuming LEDs will be needed to get the flashing that you will need) on and off using a DC switch at the desired frequency (40Hz) and duty cycle (the ratio of time that the lights are on and off). Personally, I'd consider buying the AC-DC part (this will make the project safer, too) and then you can build or hack together a simpler DC LED modulator like the one that is shown in the article I linked to, above. 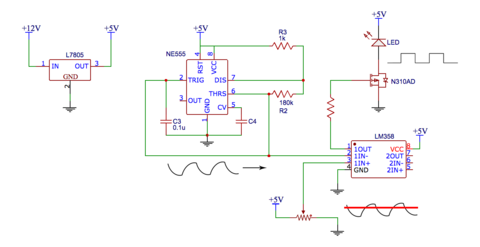 Here is the circuit from the article - it uses a 555 timer and that's a reasonable place to start if you were going to build your own circuit. If you are up for a bit of programming, an Arduino or an Adafruit Feather board can do the PWM (Pulse Width Modulation) output that you will need to drive an LED light strip. This isn't the same as modifying an existing light socket but it may be a safer and easier place to start. Therefore changing the AC power from 60 Hz to 40 Hz for a LED dimmer is NOT the SOLUTION. 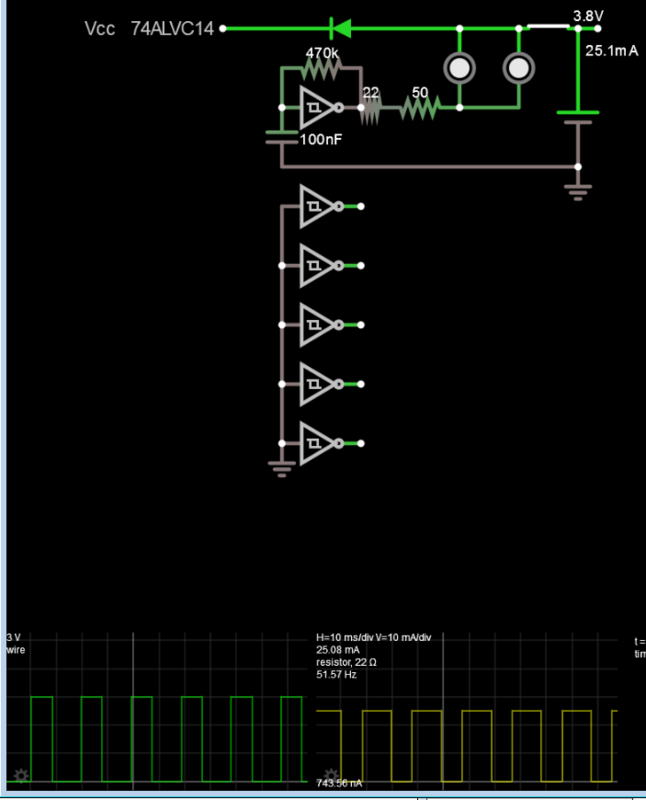 This is an XY question so I will give the better solution for 40 Hz light flicker on a cap. Recent research was done on Mice with an iPad flashing light App at 40 Hz seems to based on previous research of Trans-Magnetic Stimulation and Transcranial stimulation using impulse currents to electrodes and others using HV coils. FWIW A simple application 40 Hz LED light is a Li-on battery with a CMOS Schmitt Trigger Oscillator. ( it also much easier than the other proposed solution 3 IC's and a FET and is accomplished using only 1 of 6 CMOS inverters which can drive over 30mA from 2V but is limited to 3.6V max so a silicon diode to drop the Li-Ion battery voltage by 0.7V is needed. One only has to lookup the pin diagrams of this chip and connect the parts as shown with 1 or 2 same white LED types in parallel each using less than their rated current for maximum efficiency. ) Due to 25% tolerances 470K needs to be adjusted if one wants 40 Hz precisely, although the error frequency from 40 Hz ( e.g. +/- 10 ) has yet to be proven or even tested in humans. Elijah Rhodes is a new contributor. Be nice, and check out our Code of Conduct. Is there a Dual Voltage Regulator? Best way to create a regulated 1.95V? Is there any way to inhibit this latch circuit from locking up at startup? How do I change battery voltage output and make it constant?